Leader Notes Troubleshooting - The gray Facilitation Tips boxes aren’t printing correctly. When you print the leader notes, you may on rare occasions observe that the text from some of the gray Facilitation Tips boxes has jumped to the top of the page, covering the slide image. When this occurs, only the first gray Facilitation Tips box that printed wrong has become corrupted. Once that box has been fixed, all the others that follow it will print correctly. Locate a Facilitation Tips box from a previous page in the file that had printed correctly. Copy that box and paste it onto the page that has the first corrupted Facilitation Tips box. Copy the text from the corrupted Facilitation Tips box and paste it into the new Facilitation Tips box. Delete the original, corrupted Facilitation Tips box. 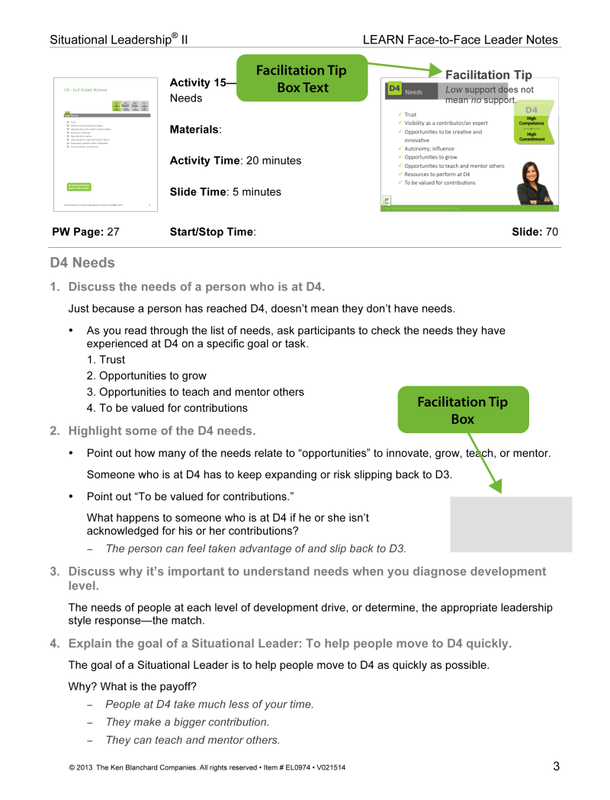 Resize the new Facilitation Tips box as needed and reposition it to where it belongs on the page. Once you have followed these steps, you can test the file to make sure it will print correctly by making a PDF instead of printing. If the Facilitation Boxes look correct in the PDF, they will also print correctly.